Parma FC, formally known as Parma Calico 1913, is a football club located in Parma, Italy. Due to financial problems in the 2000s, leading to bankruptcy the club has disappeared and reemerged under new names as Parma FC SpA and SSD Parma Calico 1913. 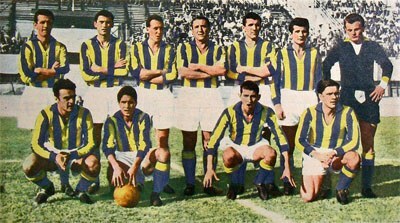 The team from the 1956-57 season. The club was originally founded in December 1913 as an adaptation of the Verdi Football Club, which came into being earlier the same year honoring the renowned opera composer Giuseppe Verdi. Parma FC first started playing league football at the outset of the 1919-20 season after World War I. The construction of the club's stadium, known as the Stadio Ennio Tardini, was completed in September 1923. The club experienced its ups and downs for the next eight years until 1931 when it changed its name to Associazione Sportiva Parma. From this time period up to the late 1960's the club was considered a side attraction to many of the Parma citizens, even being a second job for many of the players themselves. It wasn't until 1968 that the club found its way back to its true name of Parma Football Club due to being forced into removal by the Court of Parma. Shortly after in 1970, A.C. Parmense absorbed the sporting license of Parma FC, which marked a change in fortune in both performance and financial terms for Parma FC. From 1970 to the late 1980s the club made several appearances in Italy's Serie B league. The 1990s marked a golden age for Parma FC, receiving investments from their parent company Parmalat and competing regularly in UEFA competitions. Parma won the Cup Winners' Cup in 1992 by defeating Royal Antwerp in the final, when reaching the final again the next year, but was halted by Arsenal. The club also won the UEFA Cup in 1995 and 1999 by beating Juventus and Marseille in the finals. Although they never won a scudetto, Parma would earn a national cup trophy. After reaching the Coppa Italia final for the first time they would win the cup in 1992 the after beating Juventus. 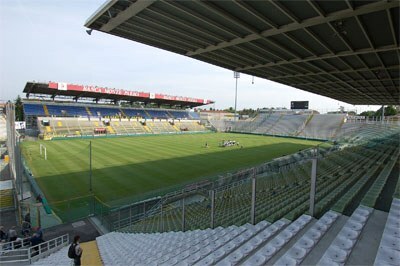 Stadio Ennio Tardini in 2008. Tragedy struck in 2004 when the club was declared insolvent due to the financial struggle of Parmalat. After three years of legislation, the club emerged as Parma FC SpA. After multiple appearances in Serie A the club filed for bankruptcy in 2015. The reconstructed club, SSD Parma Calico 1913, came into being in 2015. Although the club has managed to rise from falls, the financial troubles are not over and were in 2015 estimated to be around $100 millions. The crest is divided in three parts. Besides the header part there are two flags on the left and right. The background for the black and white colors is actually a reference to Juventus. Concerning the blue and yellow, these are the traditional colors city of Parma.